Otto Marseus van Schrik (niderl. Otto Marseus van Schrieck; CA. 1619 Nijmegen, the Netherlands - June 22, 1678, Amsterdam) is a master of the still life painter from the Dutch Golden age. Features artist Otto van Marseus Skrika:Like many Dutch painters, could not stay away from the "flower rush" and early in his career, wrote still lifes with complex bouquets. He traveled a lot, visited France, Italy, England. From his travels to Holland he brought new ideas, one of them - still life with elements of the landscape. He is considered the founder of the style "bosstilleven"(still life). 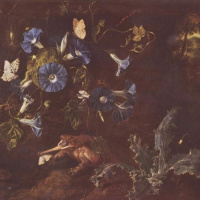 This image of scenes of nature with plants and small animals, often against the evening landscape. Unlike other artists who have written similar still lifes, Otto Marseus often portrayed reptiles — snakes, frogs and lizards. For them, the artist built in his manor house of marsh, watching them in real conditions and did many sketches. Followers of the artist who shared his love of "the forest still life" — the Dutch Elias van den Broek, Rachel Ruusand Neapolitan painter Paolo Porpora.